A basic understanding of the process model is required prior to conducting an internal audit. Your organization has already determined the key functions necessary for your company to create its product or service (clause 4.1 of ISO 9001 tells us to identify these processes and determine how they are interrelated). We suggest a high level flow diagram that shows these key functions with the product and information flow. An example is shown below. 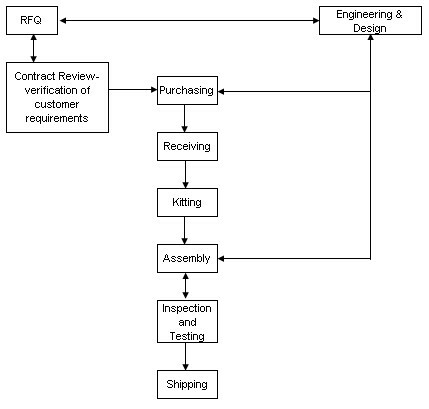 This flow diagram shows the key processes (or customer oriented processes) to be completed when creating the company's product. This is the first step, knowing what needs to be audited. Now it's time to dig a bit deeper by understanding the process model and how it works. By definition, a process is any activity or set of activities that transforms inputs into outputs. These outputs are generally inputs to another process. The high level process flow diagram above shows that this is indeed true. If we were to walk through the entire flow, we'd see how the inputs are transformed into outputs and we would also see if the product and information flow was recorded accurately. A simplified process diagram for a data entry process is shown here. Purpose- This defines what is to be accomplished with goals or objectives. Inputs- What is needed to perform the process. Think in terms of materials, equipment, labor, information. Identify where the inputs are found. Process- Define the steps taken to create the output. Control- How are the requirements (defined as the purpose) met? Identify appropriate measures and other controls such as work instructions, mistake-proofing devices, in-process inspection, etc..
Output- What is the product or service created? Having your documents under control. Records are retained and retrievable. Determination of what constitutes an acceptable output. The activity is measured and monitored. These process measures determine process effectiveness. Ensure that appropriate action is taken when issues arise. In the diagram below, you can list all the important high level information about all key processes within your organization. The document ensures an understanding of the process model and is a great tool when it is time to audit. This document, commonly called a Turtle Diagram, will detail many of the controlled condition requirements that were discussed above. To create a turtle diagram, simply fill in the boxes with the appropriate information. Beginning with the center box, list which process the diagram describes. Remember that we listed our key processes at the top of the page. Next list any equipment required to perform the process. This could be anything from a desk and chair, hand tools, soldering irons, computer with internet access to major equipment like injection molding machines, CNC machines, vision systems etc. List them all. It's better to document too many than too few. You can always go back and eliminate the unnecessary pieces of equipment. Now document the necessary inputs for the process. For the Data Entry process above we did exactly that. So in the input box we list the inputs that were not detailed in the equipment box. On to Competence/Skills/Training. Here we list either the title of the people authorized to perform the process or detail the skills and competency requirements to be recognized as able to perform within the process. Only enter the title or category of personnel if these competency requirements have been detailed on another document, like a job description. Next list the process output or outputs. Remember that more than one output can exist. In the Data Entry example we identified two outputs. This may be true in your organization as well. Identify all of the outputs. Record any procedures, work instructions, graphical aids and master samples in the Methods/Procedures box. Again, remember that you may have several work instructions that pertain to the process. Being thorough is the key to proper completion of this box. The remaining box is the Metrics and/or Target field. What measurements are being taken during or at the end of the process? Examples would include units completed, process yield, errors, cycle time, etc. If you have no process measures, determine what your company needs to know about the process and measure it. One last tip- if your current process measures are of no value to your company, find some that are! Don't be afraid to change what you measure if the data means nothing to your company. Records and Support Processes are the last topics to list. First, what records does your company have available for the process? Records of completion, inspection, production, etc are the items to detail in the records category. 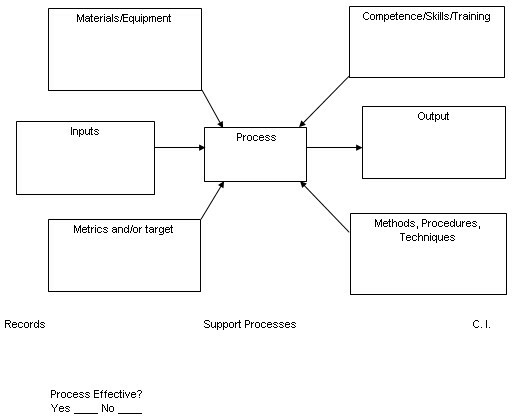 Support processes are any additional processes that have not been listed on the high level process map. Training, Document and Record Control are normally recorded under support processes. But don't limit yourself to only these 2 processes. The process that created the output that is the input to your process can also be considered as a support process. Now you should have a good understanding of the process model, how to describe your processes and the key components of a process. Follow these guidelines and you're well on your way to having robust processes. Copyright 2007-2014 Carpenter Group LLC All rights reserved.